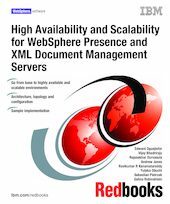 In this IBM® Redbooks publication, we describe how to create scalable and highly-available solutions that incorporate only two of the WebSphere products for Telecom : the IBM WebSphere® Presence and the WebSphere XML Document Management Servers (XDMS) . IBM WebSphere products for Telecom is a set of service enablers that extend the IBM WebSphere Application Server to deliver full IP Multimedia Subsystem (IMS) standards-compliant platform for creation and delivery of next-generation telecommunications services. Part 1, “ Introduction” - in this introductory part, we provide an overview of the IBM WebSphere Presence Server and XDMS Document Management Servers and describe the sample scenario that we use throughout this book to demonstrate availability and scalability. Part 2, “ The base scenario” - in part 2 of the book, we provide an overview of the base environment for our sample scenario, which includes the architecture and topology. We also describe how to set up and configure the different components in the base environment. We conclude with the execution of test cases that validate the base environment. Part 3, “ The High Availability (HA) scenario” - in part 3, we describe the enhancements to the base environment to make it highly available. We demonstrate fail-over processing following failure of servers in the environment. Part 4, “ The scalable scenario” - in this part, we describe how to configure additional servers to make the highly available environment scalable. We demonstrate the distribution of messages to additional servers that are introduced to the environment. Part 5, “ Appendices” - we provide additional information and pointers to related publications and other useful information that includes how to obtain the scripts for the sample scenarios.